During the Victorian era of 1800’s, Napoleon’s conquest of Egypt threw open the Gates of Egypt’s history for the Europeans. At that time, mummies were not accorded the respect that they deserved from the European elites and in fact, mummies could be purchased from street vendors (as shown in picture) to be used as the main event for parties and social gatherings that took place in the 18th century. The elites of the era would often hold “Mummy Unwrapping Parties”, which, as the name suggests, had the main theme in which a Mummy would be unwrapped in front of a boisterous audience, cheering and applauding at the same time. During that period of time, the well-preserved remains of ancient Egyptians were routinely ground into powder and consumed as a medicinal remedy. Indeed, so popular was pulverized mummy that it even instigated a counterfeit trade to meet demand, in which the flesh of beggars was passed off as that of ancient mummified Egyptians. As the Industrial Revolution progressed, so Egyptian mummies were exploited for more utilitarian purposes: huge numbers of human and animal mummies were ground up and shipped to Britain and Germany for use as fertilizer. Others were used to create mummy brown pigment or were stripped of their wrappings, which were subsequently exported to the US for use in the paper-making industry. 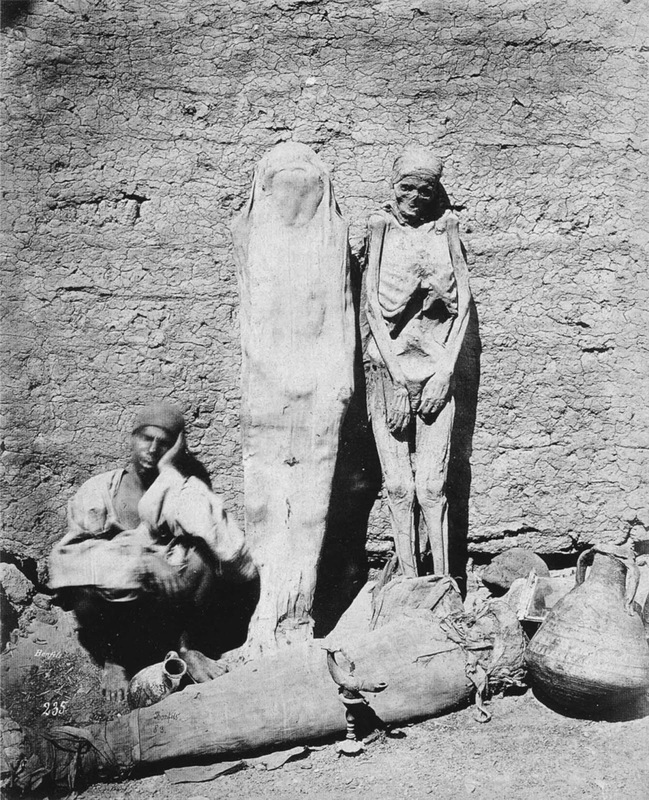 The author Mark Twain even reported that mummies were burnt in Egypt as locomotive fuel. As the nineteenth century advanced, mummies became prized objects of display and scores of them were purchased by wealthy European and American private collectors as tourist souvenirs. For those who could not afford a whole mummy, disarticulated remains – such as a head, hand or foot – could be purchased on the black market and smuggled back home. So brisk was the trade in mummies to Europe that even after ransacking tombs and catacombs there just were not enough ancient Egyptian bodies to meet the demand. And so fake mummies were fabricated from the corpses of the executed criminals, the aged, the poor and those who had died from hideous diseases, by burying them in the sand or stuffing them with bitumen and exposing them to the sun. Mummy brown was originally made in the 16th and 17th centuries from white pitch, myrrh, and the ground-up remains of Egyptian mummies, both human and feline. As it had good transparency, it could be used for glazes, shadows, flesh tones and shading. Artists believed that when bitumen and mummified flesh were used in oil paint it wouldn’t crack or dry. Mummy Brown eventually ceased being produced in its traditional form later in the 20th century when the supply of available mummies was exhausted. Mummia or mummy is either a substance used in the embalming of mummies, or a powder made from ground mummies, used as a “medical preparation”. Ancient Egyptian mummy-making often utilized asphaltum (Persian: mumiya) as an ingredient for filling the empty body cavities once the organs were removed. In the Middle Ages, the resin that had been used on ancient Egyptian mummies was believed to have superior medicinal and chemical value to regular asphaltum, and the resulting demand for the ingredient caused the term to be applied to the dead bodies required to harvest it as much as to the ingredient itself.